I've started doing yoga on Saturdays at my gym, and it's been great for my muscles, my morning, and my mind. Last Saturday, I took a Vinyasa yoga class at my gym, and I really enjoyed it. Vinyasa is so great because you really get a good stretch in, and so many of the poses can be challenging. You end up totally relaxed by the end of the class, but sweating like a hog. It's great! For me, waking up is the hardest part of the day. Getting my eyes to cooperative with the sunlight is the first in a series of poorly executed wake-up actions. This is typically followed by a smash of the snooze button, a grumble, a burrow under the blanket, and eventually the roll/fall/climb out of the bed. While waking up on any given day is a challenge, I always find it especially difficult when I'm starting a new class at the gym, and the class starts at an ungodly hour (typically before 6 p.m.). On this particular day last week, I found myself in this predicament once again. Do I wake up, go to the gym, do some yoga, or even Zumba if the yoga class is full? Or, do I continue sleeping here, wasting away a beautiful fall day. Fortunately, I chose the former this time. I threw on a pair of Under Armour leggings, a fitted New Balance racerback tank, and my New Balance gym shoes. 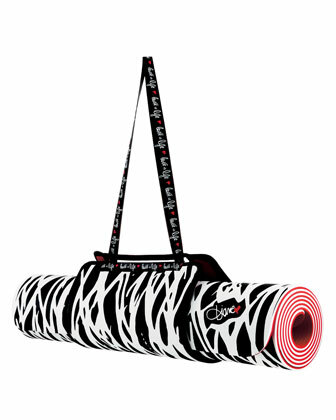 I grabbed my adorable yoga mat, and headed out to the gym. I got some prime real estate in the classroom (in the back corner of the class, so nobody could see my stinking up the poses). The instructor showed up a few minutes late, which gave me some time to shake out some of the jitters. I hadn't taken an actual yoga class in a few years (my living room and On Demand don't count), and wasn't sure how I was going to perform. I'm extremely competitive, so the last thing I wanted to do was be the worst in the class. The instructor arrived, and promptly ordered us to clear our heads, begin breathing properly, and reeeeelax! The class was great! The instructor wasn't one of those weird yoga people who speaks in cliches in a weird "I'm trying to whisper in the library" kind of voices. She made a few funny comments, but generally speaking, the majority of her words were focused on the poses, which I fully appreciated. When the class ended, I headed home, and felt so optimistic! Having completed an hour of yoga, I felt like I'd already accomplished something. All of those muscles that were tight from a long week of volleyball were suddenly much less tight. My mind felt refreshed, and I actually felt like I'd gotten a good workout in. I think that taking a class like Vinyasa yoga on a Saturday morning is perfect for people who have similar schedules to me. I work so hard during the week! I really enjoy being able to clear my head and get a great stretch on all of those tight volleyball muscles on a Saturday morning. This doesn't mean that I don't exercise for the remainder of the weekend; instead, it means that I can hit the reset button on certain muscles, making it easier for me to cut down a lot the recovery time I have when I've gone hard all week. What do you do to unwind after a tough week or workouts? How do you rest your mind and body? I'm a big fan of yoga. I've been doing videos at home on weekends first thing. I feel so stiff starting out but I feel so relaxed and good afterwards. Love your yoga mat. Yoga is amazing! I love how it feels like meditation mixed with sweat!